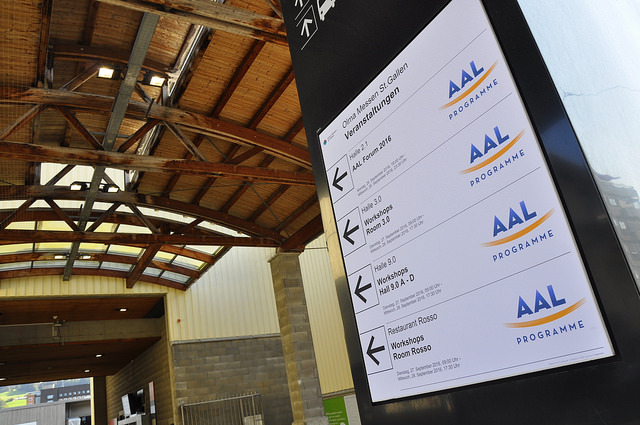 The AAL Forum is the yearly event of the AAL Programme. Active participation and interaction between the forum attendees is key in the 2017 AAL Forum program. In 2017 we aim to create an interactive and inspiring event, building on the creativity and the commitment of the AAL community. In this AAL Forum, we want to explore the gaps that need to be bridged to the deliverable of AAL technological solutions to the ageing well in Europe. This Forum is following the involvement of each attendee, with a call for action: “What can YOU do?” The event will give a special emphasis on showcasing AAL technologies and solutions pre-market and on the market and on the organisation of interactive and motivational sessions & workshops with the AAL community contribution. We invite YOU to send in your proposals for the design and the organisation of the interactive sessions and/or workshops: from developing a programme and identifying all stakeholders involved to describing the expected outcomes and keeping in touch with the AAL Forum programme committee to make sure that all session information are available online. THEME 1: THE AAL CONTRIBUTION TO THE EUROPEAN STRATEGY ON ACTIVE AGEING? This track aims to present how the main European Initiatives (e.g. EIT Health, EIP-AHA, AAL Association), are implementing action streams related with Active Assisted Living, and how they are aligning their strategies to leverage Europe’s competitiveness in that domain. This theme aims to present two complementary perspectives influencing the AAL solutions Roll-Out: in one hand how Governments perceive value in AAL Solutions and how they are embedding these in the national health and social care systems (macro approach); on the other hand, how the regional authorities, municipalities and service providers (micro approach), perceive the value of AAL Solutions, and how these are incorporated in the daily operation. Sessions in this theme could include topics such as: Good practices of Pre-Commercial Procurements (PCP) and Public Procurement of Innovative Solutions (PPI); Shared savings model; PPPs as an innovative financial models; Large companies interested in broadening their scope; Risk investment (nonprofit and for-profit ventures); Time banks; Regulatory aspects and others related with innovative financial models to deploy AAL Solutions. This theme aims to understand ways to reach the adoption of AAL solutions, focused on the identification of the gap between the user needs and the AAL solutions. There is an added value chain that AAL projects need to follow to meet customers’ needs and expectations. The proposed ideas for workshops are expected to explore every step of this journey, looking for common reasons of rejection and adoption. Sessions in this theme could include topics such as: Maslow’s Hierarchy of Needs – which needs are AAL solutions addressing; Biodesign – How to identify user needs (primary, secondary and tertiary end-users); Basic requirements of primary, secondary and tertiary end-users ( e.g. Digital literacy, ethical aspects or Interoperability); The perceived value and price elasticity of AAL Solutions. This theme aims to learn from previous experience of successful cases, answering the question “If our project started today, what would you do differently”. Will also address relevant inherent indicators to increase the impact of AAL Solutions, considering the past experience and AAL projects good practices and methodologies. Sessions in this theme could include topics such as: Improving technical and exploitation approaches to meet user expectations in AAL ( How define better pilots for AAL projects; Evaluation methodologies; Indicators; How to define the number of users to involve in the pilot ; Relevant outputs to prove the value of the new solution comparing with the current approaches); Requirements for data protection in different countries and markets; good practices, experiences and methodologies. Name of session chair/workshop leader. Selected proposals can be put forward for a time slot of 1.5 hours. The session coordinator will be held responsible for the timely communication of all information regarding the content and the name of the speakers/experts to the AAL Forum organisers. Furthermore, each session coordinator should make sure that a summary of the session is available and that all presentations are made available in the website after the AAL Forum. PLEASE SHARE YOUR IDEAS AND PROPOSALS WITH US UNTIL 1 MAY, 05.00 PM!